As spring lurks further and further behind us and summer comes to an end, allergy sufferers everywhere are rejoicing that the end of allergy season might finally be over. However, there’s another common allergen waiting to strike: ragweed. (We’ll wait while you grab your tissues and eye drops). Ragweed grows everywhere in the United States, but is especially common in the Northeast and Midwest, so our little East Stroudsburg wellness center is right in the middle of the fun. It also strikes late in the season, with the first blooms starting around mid-August, and the peak ragweed season hitting in September. Each ragweed plant can produce nearly a billion pollen grains each season and is one of the most common causes for allergies in the world. In fact, nearly ¾ of allergy sufferers experience symptoms associated with ragweed. 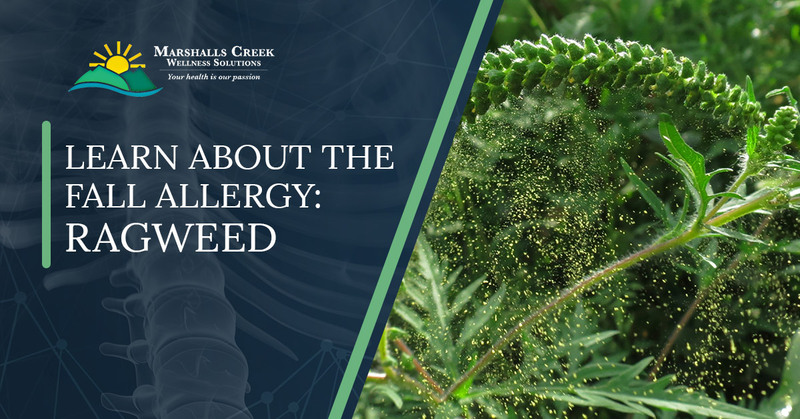 Because ragweed cross-pollinates, their pollen grains are designed to be released and float through the air until they either fall to the ground, pollinate another ragweed plant, or worst of all, enter our respiratory systems. When this happens, those affected can experience a number of severe symptoms. Some of these include sneezing, runny nose, congestion, headaches, itchy eyes, and sore throat. For those with asthma, these symptoms can be more severe and include wheezing, coughing, and shortness of breath. Keep windows closed. Because ragweed pollen grains are so small, they can easily float through a window screen and enter your home. Be sure to keep your windows and doors closed in your home and while driving. Watch the pollen count. The American Academy of Allergy, Asthma & Immunology keeps count of pollen levels in various cities. You can see that here and use the map to find the allergy levels for that day. When the pollen levels rise, you will know to take extra precaution when outside. Give your dog a bath. If your dog spends a lot of time outside, they can collect ragweed pollen in their fur. The next thing you know, the pollen is all over couch, bed, and your hands from petting Fido. Give your pup more frequent baths during allergy season. The same goes for your cat, though if your cat refuses to bathe, be sure to brush them regularly. Make sure you have a rescue inhaler if you have asthma. You never know when a large gust of ragweed pollen will exacerbate your asthma. If you currently have or have had asthma in the past, talk to your doctor about how to prevent allergy-related asthma attacks and carry a rescue inhaler with you. Learn about allergy therapy. At Marshalls Creek Wellness Solutions, we offer allergy treatments to help reduce the symptoms associated with allergies. This system has proven successful for many of our patients, and we would love to extend this service to all who experience allergies, asthma, and other conditions. While we are most known for our chiropractic services, we are truly a full-spectrum wellness center specializing in everything from nutritional counseling to treatment for allergy symptoms. To learn more about what allergy symptom treatment options we have at our East Stroudsburg wellness center, fill out our contact form or give us a call to schedule an appointment. We’re more than happy to answer your questions and find a way to provide treatment from allergy and asthma symptoms!